Great products can only be as good as the designer. 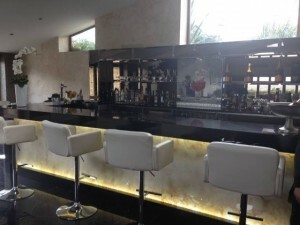 We are lucky to work alongside and supply some of the UK’s most experienced commercial designers and installers who choose to use our bar panels in their projects. This latest installation from Dawnvale Hospitality Solutions is a domestic project. Dawnvale primarily design and install bars and furniture for commercial projects including the likes of TGI Fridays, the Radisson and even the Hilton. However, they also offer a design and installation service for high end domestic properties. The project involved a full refurb and build of a home bar, with the client wanting something a bit different for the bar fronts. The designers at Dawnvale recommended using a Versital translucent marble look bar panel, with back lighting for a striking effect. 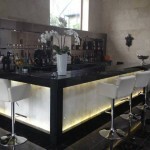 The mix of the chunky black high gloss bar top and back lit bar panels works especially well together. To create this look Dawnvale chose bar panels from Versital in ‘Autumn Onyx’ that are available made to size specification and to order. This beautiful marble finish has a translucent quality that can be backlit. 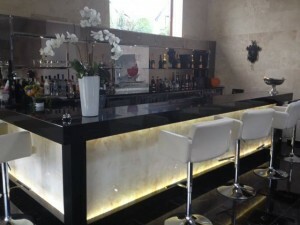 The choice of backing light colour can also change the look of the marble panels to suit your theme and clients taste. There are 8 different translucent marble options available which can be backlit for use on bar fronts or as display areas. As a bonus, the panels are also 100% waterproof, stain resistant and very easy to clean. Ideal for the home, or a busy public bar area. Versital decorative solid surface panels are also available as a non translucent option in a wide range of colours, including granites, marbles, solid colours and sparkles. For advice or a personalised quotation on decorative solid surface panels please call us on 01204 380780, or send through a contact form. You can take a look at other projects Versital solid surface panels have been used for on our website.